We are hosting a fundraiser, because we want to help Boston Children’s continue its research for DIPG and to find a CURE!! 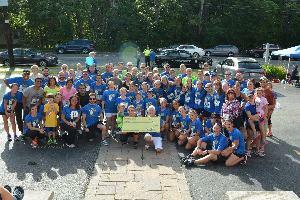 FIFTH Annual Crushing Cancer 4 Kids 5K Walk/Run! This event will benefit Boston Childrens Hospital and funding will go directly toward DIPG Brain Tumor research. What is DIPG? Diffuse intrinsic pontine glioma (DIPG) is a brain tumor found in a part of the brain stem called the pons. The pons controls essential bodily functions such as heartbeat, breathing, swallowing, eye movement, eyesight, and balance. DIPG affects children almost exclusively. Approximately 200-400 children in the United States are diagnosed with DIPG each year. These children are typically between the ages of 4 and 11. DIPG accounts for roughly 10-15% of all brain tumors in children. Only 10% of children with DIPG survive for 2 years following their diagnosis, and LESS THAN 1% survive for 5 years. The MEDIAN survival time is 9 months from diagnosis. Please read what Dr. Kieran of Boston Children's is currently working on!! Diffuse intrinsic pontine gliomas (DIPG) are the most lethal of all pediatric cancers. But now that researchers at Boston Children’s are learning so much more about the underlying biology and the mutations that drive the majority of DIPG tumors, we can finally begin to develop new treatments. In the coming year, we hope to begin a multi-institutional trial to test a new targeted therapy on a subgroup of patients with DIPG, who share one particular mutation. In another dramatic development we are partnering with a company to design vaccines against the mutations we have identified. The vaccines being created are made from small, simple proteins called peptides. They won’t prevent a child from developing DIPG. Rather, matched to the mutations that are propelling the cancer, the vaccines will stimulate the patient’s immune system to hone in on the cancer cells and destroy them. Our goal is to begin to evaluate one of the vaccines in patients within a year. Please support my fundraiser—and Boston Children’s Hospital. K & J Fitness Enterprises, Inc.